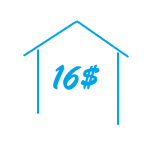 16 Dollar House is designed for educational and informational purposes only and should not be inferred for professional financial advice. The site provides a variety of links and articles that are finance related. Individuals needing money advice should contact a Certified Public Accountant (CPA), Chartered Financial Analyst (CFA) or a Certified Financial Planner (CFP). 16 Dollar House strives to provide accurate and genuine articles in regards to a variety of financial topics. The views and opinions expressed herein are those of the author.